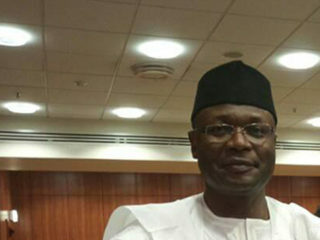 Chief Martin Onovo, a petroleum engineer and presidential candidate of the National Conscience Party (NCP), fielded questions from students and journalists on some key issues in the polity regarding the 2015 elections. THE NCP may not have the sort of structure put in place by other major political parties that are being financed with proceeds of corruption. Our strength is people-based, which is the ultimate strength and advantage. Our supporters are not commercial people; they do not receive salaries or stipends. 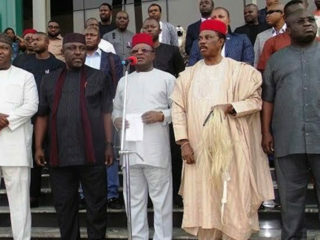 NCP followers are people who make sacrifice to advance their country, Nigeria. They are Nigerians, who will not mortgage their conscience. I have been involved in activism since 1987. Also, as national leader of the Strategic Union of Professionals for the Advancement of Nigeria (SUPAN), we challenged individuals and various groups that advanced Third Term; and we were part of the vanguard against deregulation. I have been in the struggle against national dysfunction for decades. Unlike many other people vying for elective positions, I am free of political blemish and free of leadership stain. The records are there. First, I am sacrificing myself for rapid development of Nigeria taking into consideration the religious definition of love. For the people of Nigeria that we love, NCP has proposed: (1) A 10-Care programme (Employment, Food, Health, Housing, Education, Water, Electricity, Transportation, Telecommunications, and Security Care) and (2) Accelerated Development Agenda (ADA). Let me briefly discuss Security Care. The NCP will manage security, using a world-class management system that must indicate Expectations, Feedback System, Scope, Work Processes, and Corrective Action Capabilities. NCP government will establish and sustain a robust means of monitoring, surveillance and gathering intelligence in order to make the right decisions based on information. There will be adequate funding of our armed forces and other law enforcing institutions. NCP will ensure that adequate welfare and weapons are constantly available to members of our armed forces. As soon as all these are in place, Boko Haram will be ousted from Nigeria; Nigeria will cease to be a base for terrorists. The NCP anti-corruption strategy is called the 4Es — Example, Empowerment, Education, and Enforcement. We believe that corruption is unethical, inappropriate, destructive, and sinful. NCP-led government will lead by example. We will empower our people through employment, welfare, and orientation. We will raise the minimum wage (by reducing maximum wage), as the current minimum wage is an insult to the Nigeria people. We may not waste our time with the past; it is a distraction. We will allow the cases that are going on to go on, but we will start with ourselves. We will have the moral authority not to condone corruption. Given NCPs 10-Care programme, what we have pledged to the Nigerian people is that an NCP-led government would double power generation, transmission and distribution in less than three years via a $9 billion investment. This is a radical approach, taking into account the fact that from 1999 until 2014, Nigeria spent about $51 billion (N9.5 trillion) on power, yet the power output is still what it has been since 1999. You must understand what it means to be an energy expert. Energy is my field of professional expertise. My first degree from the University of Ibadan is in petroleum engineering. My second degree from the University of Houston, Texas, is in petroleum engineering economics. I profoundly understand this subject. I understand the energy side and the economy side. I comprehend the project side, as this is what I have done for a living for over 20 years. The trouble with Nigeria is leadership. 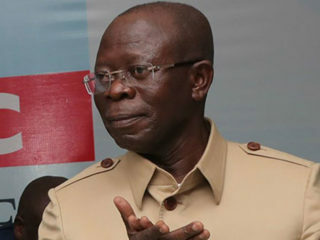 In other words, I absolutely agree with Nigeria’s leading ethical intellectuals, including the late Chief Gani Fawehinmi, the founder of the NCP; the late Emeritus Professor Chinua Achebe; Mohammed Uwais, the former Chief Justice of Nigeria; Emeritus Professor Wole Soyinka, and Emeritus Professor Ben Nwabueze, who have inked that Nigeria’s primary problem is leadership. So long as Nigeria is led by corrupt, dishonest and unethical characters, this country will be in trouble. You have to ask the Office of the National Security Adviser (NSA). We believe there is a grand conspiracy against the candidate of the Nigerian people given this brazen failure of the Office of the NSA to invite the NCP presidential candidate to the Electoral Violence Workshop. Nigerians must ask, as we in the NCP ask: If the Office of the NSA cannot reach a presidential candidate, how can it capture Abubakar Shekau of Boko Haram? I will lead by example. NCP is ready to lead Nigeria by example. I am ready. NCP will fulfill its promises to the Nigerian people. • Culled from the Internet.